In truth, slavery sucked. It dehumanized the slaves, destroyed families, destabilized society, and skewed America’s economic development. 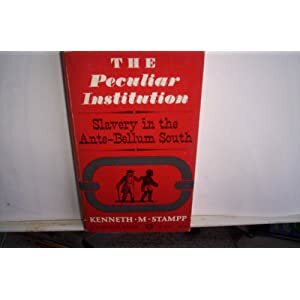 But before Stampp’s book, there was a national consensus (except, of course, among the descendants of slaves) that the slavery really wasn’t that bad. Abraham Lincoln quoted scripture in his famous speech in 1858, a couple of years before the Civil War: “"A house divided against itself cannot stand." He proved to be correct. Eventually, freedom won out, but it took more than a century to give African Americans the full freedom they deserved. I was thinking about The Peculiar Institution when I read the New York Times over the weekend and then watched a 60 Minutes piece on what amounts to slave labor in China. China is a big country and it has a long, historic tradition. I get that we must tread carefully with the Chinese, that we owe them a bunch of money, and that they have had stupendous economic growth. But if the allegations that are made by the Times and 60 Minutes are true, they are employing slave labor to produce American products. According to the stories, Chinese workers routinely work 90 hours a week. Child labor is routinely used. Abuse is common. Suicide is endemic. We don’t do that in America anymore (unless of course, you are a first year attorney in a big law firm). We used to do it, but we fought a civil war to stop it. Our economy is skewed because of a clash of economic systems. Slavery and free market capitalism don’t mix. Sure, American consumers get cheaper prices, but that leads to over-consumption. It also means that we send most of our money there (which explains why the Chinese have all of our money). I was a big fan of permanent trade relations with China when we passed it under the Clinton Administration. I believe (and wrote) at the time that free markets will mean more freedom for the Chinese people. Guess what? I was wrong. Sure, some Chinese are doing quite well, but then again, many Southerners did very well during the slave years. But since most Chinese don’t have the freedom of expression, the freedom of religion, the freedom of assembly, and most importantly, the freedom to vote, they live a slave society. By continuing to do business with the Chinese elite, without insisting on more freedom, we give them the resources to build their military, modernize their police state, and buy our debt. A system based on slavery cannot coexist with a system based on free market democracy. China’s peculiar institution is every bit as dangerous as was slavery in Dixie.